“Today we’re taking our innovation in mobile to the next level and I’m honoured to share with you our vision for a new generation of smartphones. Ladies and gentlemen I give you the future of mobile display technology – the Infinity Flex display. “Today is a big milestone and I’m sure you’re all wondering what it looks like in real life and how it works – well wonder no more, it’s finally here. 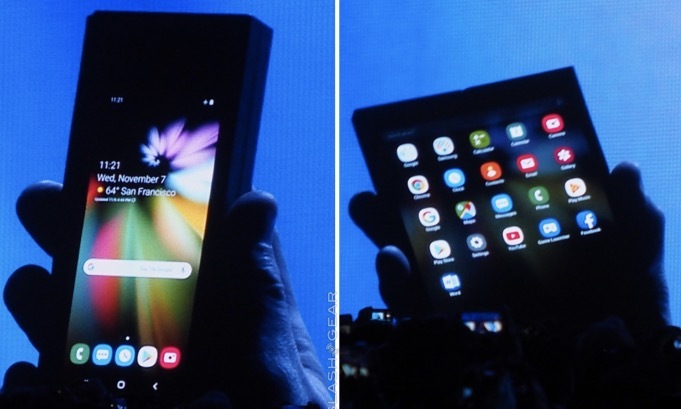 When it’s open it’s a tablet offering a big screen experience. When closed, it’s a phone that fits neatly inside your pocket. “Now, of course, I’d get in trouble if I showed you everything today so we’ve disguised the elements of the design but trust me there’s a device inside here and it is stunning. "The Infinity Flex display represents an entirely new mobile platform. We’ve always strived to bring new meaningful breakthroughs but despite all that progress we’ve been living in a world where the size of your screen can only be as large as the device itself. Well we’ve just added a new dimension to help you browse, watch, connect and multi-task like never before. "The Infinity Flex display is the foundation for the smartphone of tomorrow. "To build it we had to invent new materials, throw out old assumptions, and reimagine the display from the ground up. 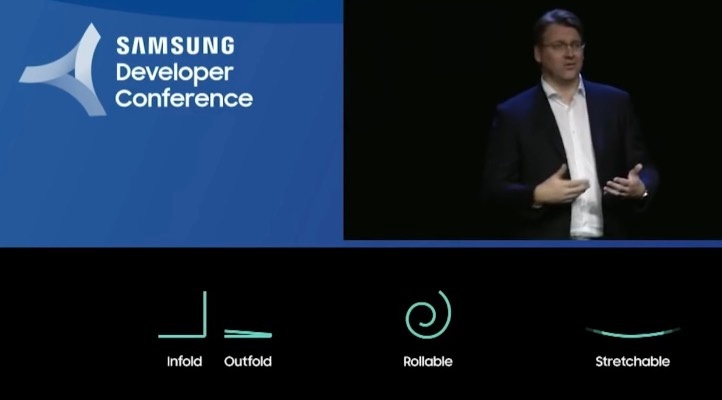 "And it’s Samsung – when we say reimagine we mean actually designing something new!" "We re-thought the anatomy of a smartphone display, including the underlying display components, as well as the cover window which is the top layer of solid glass. "As you know, glass is the popular choice for the cover window because it protects the rest of the display and it looks beautiful, but its inherently inflexible so we had to replace it with something that has the same benefits yet achieved something new. "We had to invent a new protective layer. In this case, an advanced composite polymer that’s both flexible and tough. "The next challenge we faced was that, until now, displays have been static, meaning once we combine all the component layers, they never had to move. "Now that’s all changed, as the Infinity Flex display has been designed to be folded and unfolded repeatedly without any degradation. "To do this we had to find a new kind of malleable adhesive that allows us to laminate the display layers together securely while enabling them to flex. Which we did, in making this new display flexible and durable enough to be folded hundreds of thousands of times. 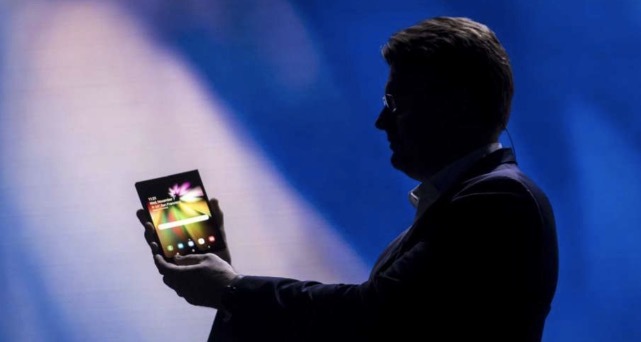 "Then we hit our final and perhaps biggest challenge, because for this display to be foldable we had to make it thinner than any other mobile display we’ve ever made." 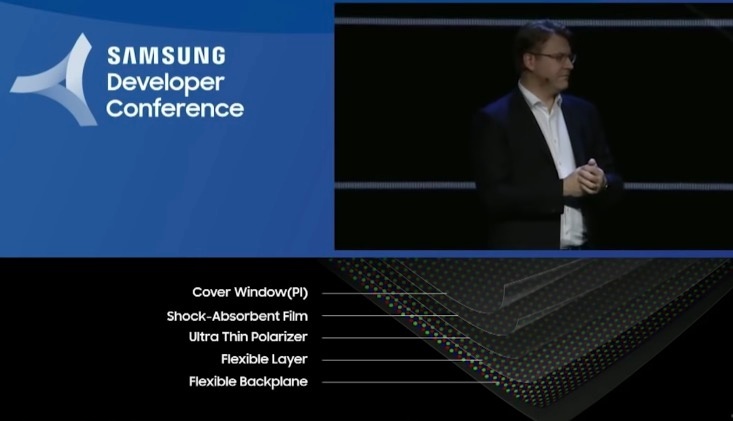 "In this case we had the opportunity to reduce the thickness of the polariser which is an essential layer that filters external light, reducing glare so that you can read the display; and to solve this we created a new polariser that’s 45 percent thinner. "Our innovation pipeline includes new technologies such as rollable and even stretchable displays." "What you’re seeing today is the result of the most talented engineers and designers in the world making incredible breakthroughs to create something amazing for you. And this isn’t just a concept, the breakthroughs we have made in display materials have been matched by breakthroughs in manufacturing. As a result we’ll be ready to start mass production in the coming months." Will the next generation Samsung design rescue smartphone sales?